Contents Order individual numbers as needed or purchase a kit which includes numbers 1-10. 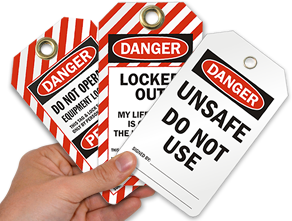 Use Energy Source Identification Tags as part of a comprehensive Lockout procedure to comply with OSHA. 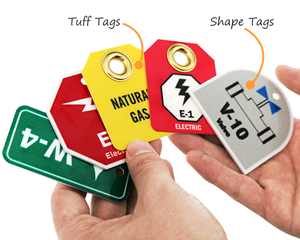 Series numbered tags support machines with multiple energy sources. • Vibrant colors, bold graphics and unique shapes are ideal for machine-specific procedures that can be easily and quickly identified. • Available in two materials and choice of different numbers. 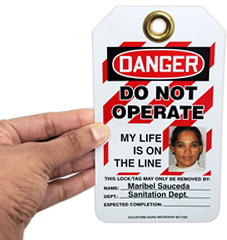 • Plastic Tags come with 3/16" hole. 6 mil thick, laminated vinyl (Dura Vinyl) for flexibility. High gloss overlaminate bonds to printed image. 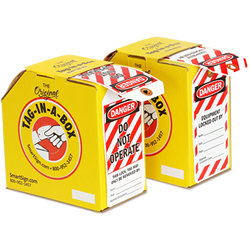 Graphics protected from water, chemicals, and abrasions. Square corners and permanent acrylic adhesive backing. Graphics protects from water, chemicals, and abrasions. Square corners, and permanent acrylic adhesive backing. 60 mil thick rigid plastic with 2.5 mil thick non-glare laminate. Resists impacts, abrasions, and humidty. Have 3/16" hole for hanging, or wires. Durable plastic delivers exceptional performance. Thick rigid plastic protected by 2.5 mil non glare over laminate. Resists impacts, abrasions, humidity and chemicals. Plastic Tags come with 3/16" hole.